Obituary for Martha M. Roberts | Kaczorowski Funeral Home, P.A. 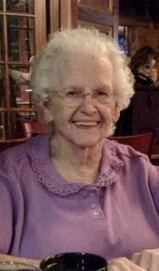 On March 27, 2019, Martha M. Roberts beloved wife of the late Herman J., loving mother of Shirley Schuhardt and her late husband George, Elaine Haffner and husband Jeffrey, Nancy Roberts and her spouse Darlene Pilarski, Michael Roberts, Carol Roberts and partner Eric Kelly, and the late Marie Roberts. Grandmother of Melanie Christina Schuhardt, Michael Joseph and Ashley Roberts. Great grandmother of Evie and Connor Duschl. Visitation at the Kaczorowski Funeral Home, P.A., 1201 Dundalk Avenue on Sunday from 1-3 and 5-7 pm. A Funeral Mass will be held on Monday, 10 AM, at Sacred Heart of Mary Church. Interment to follow at St. Stanislaus Cemetery.